The goal of peer groups is to promote social connections and natural support systems. Below you will find the current peer group opportunities, as well as links to flyers for each group. If you would like more information about a group listed below, or have an idea for a new group, feel free to let us know! 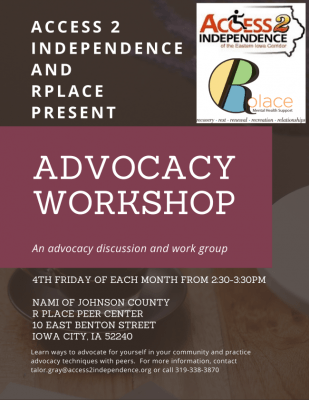 Join Access 2 Independence every 4th Friday of the month from 2:30pm – 3:30pm for the Advocacy Workshop! 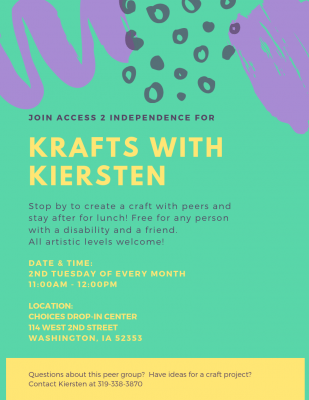 Free for any person with a disability and a friend. All artistic levels welcome! 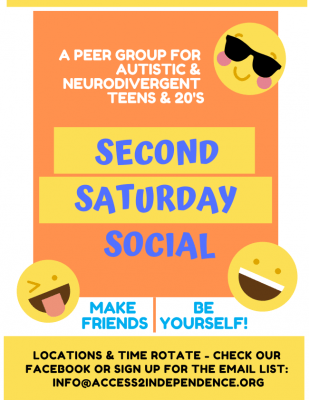 Second Saturday Social was formed to promote socialization opportunities for autistic young people. This group allows neuro-diverse young people to build friendships and interact in an inclusive space where peers can support each other. 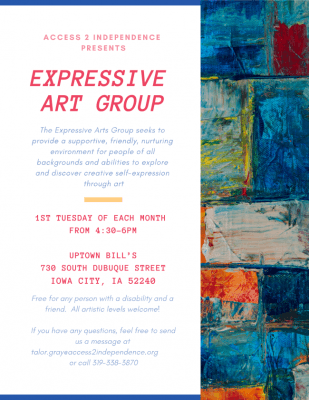 The group rotates to a new location every month. Participants can choose to engage in the monthly activity, chat with others or simply observe until they feel comfortable with the group. Changes every month depending on the event. Check out our Facebook page or join our email list for event updates.